Romeo and Mom is a heart-warming love story of a different kind, a moving and uplifting comedy that rises from the most tragic of circumstances, marked by a strong sense of character and excellent performances. 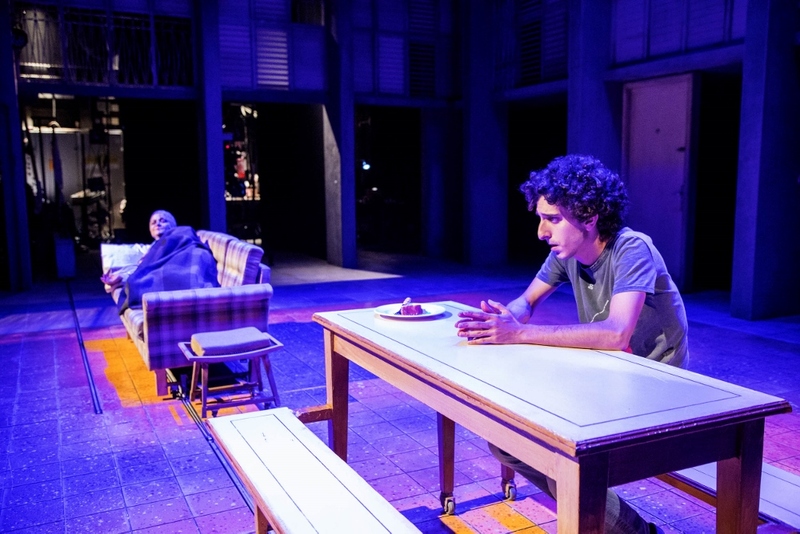 Written by Gur Koren and Gilad Kimchi, and directed by the latter, the play is set in a present-day development town in the south of Israel, Tikvot (Hopes). There’s not a lot to hope for here, and most of the town’s residents are barely eking out a simple existence, but there’s a lot of love. Suzie (Sara von Schwartze) is raising two children on her own, stretching out a meager social worker’s salary to help out friends and neighbors in need. She’s also the support and sounding board for her sister Natti (Magen Shabo) who relies on the advice of a woman “touched by God” to foretell her future. Little sister Tehila (Lia Amiram Rokah) is in love with the digital age and all it has to offer, her conversation peppered with snappy phrases from reality shows and pop culture. Teenage Muli (David Shaul) is on the brink of adulthood, feeling the weight of responsibility he wants to help out at home, but still has ample time to hang out with his best friends Adiel (Dolev Ochana) and Shitrit (Elad Atrakchi). They live in the kind of Israeli neighborhood where clusters of apartments with their institutional gray plastic shutters surround a shared yard for clotheslines and gossip. It’s the kind of place where family is all-important, and friends are almost like family. Eran Atzmon’s simple, yet evocative set conveys a sense of the home, the neighborhood, and their atmosphere. The only person from Tikvot every to have made it big is Sasi Ben Atar (Roy Assaf), who has propelled his success on a reality show to stardom. Imagine the excitement when Sasi announces that he will be directing a production of Romeo and Juliet and selecting his Romeo from among the youth of his hometown Tikvot! Muli’s theatrical aspirations have for the most part been limited to performing in the kitchen with Adiel and Shitrit, Tehila taking on the joint role of audience and critic. This might be his big chance, but this news is followed by bad news about his mother’s health. Now, all Muli can think about is how to help his mother – and hilarity ensues. Muli is willing to do just about anything to cheer his mother up, and becomes more and more entangled in a web of lies and madcap misadventures that grows ever wider, ultimately encompassing the whole town. While at first it might seem odd to have a comedy centered around a main character with a serious illness, rarely in life is the narrative so neatly divided between the comic and the serious, and the writing duo of Koren and Kimchi manage this balancing act with panache. Sara von Schwartze and David Shaul carry the strong dramatic leads with profound depth, emotional nuance, and exquisite comic timing. They are surrounded by a great cast of flamboyant characters, from Suzie’s volatile yet caring sister Natti to Muli’s hilarious buddies Adiel and Shitrit, not to mention the over-the-top outsiders, Sasi Ben Atar and his reality-show entourage. 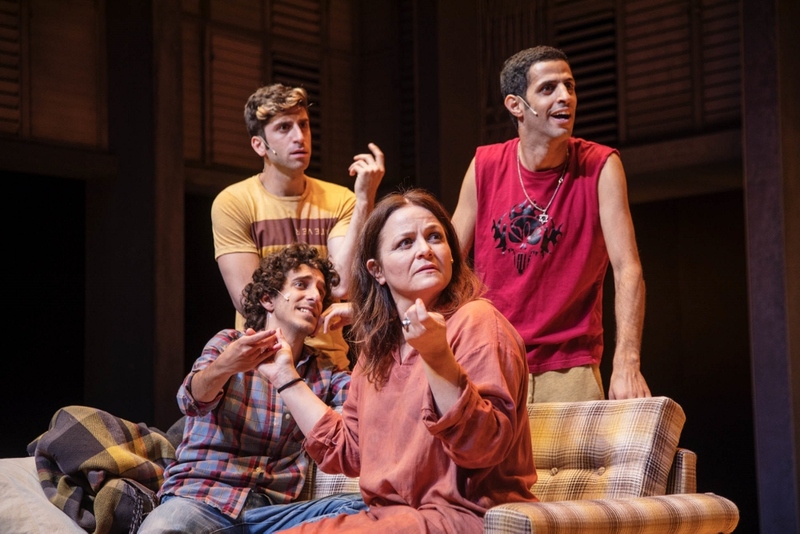 Roy Assaf is very funny as Sasi, with his mannerisms and pretensions as well as a moral compass and artistic sense that is in conflict with the demands of popularity. On the night I saw the play, Lia Amram Rokah imbued the character of Tehila with an endearing precocity, a vibrant energy shining very brightly. Yet the great strength of this play is in its depiction of a strong female lead and mother-son relationship that transcends all clichés. Suzie’s life as a woman, a mother, a sister and friend, is depicted in precise details, small authentic moments that never once slip into melodrama. Her love for Muli is never suffocating or self-aggrandizing. She does not try to make him cling to her or fulfill her dreams. On the contrary, she pushes him to discover his own passions and live them to the fullest. Her pain is palpable, as is her joy. Sara von Schwartze is radiant in this very memorable performance. Written by Gur Koren and Gilad Kimchi; Directed by Gilad Kimchi; Set: Eran Atzmon; Costumes: Orna Smorgonsky; Music: Amir Lekner; Lighting: Avi Yona Bueno (Bambi); Video: Yoav Cohen; Director Assistant: Amit Apte; Cast: Suzie – Sara von Schwartze, Mully – David Shaul, Natti Anat – Magen Shabo, Sassi Ben Atar – Roy Asaf, Nisso – Nisso Kavia, Adiel Ezra – Dolev Ochana, Yehuda Shitrit – Elad Atrakchi, Daria/Fanny – Osnat Ben Yehuda, Yam Goldberg/Pnina – Adva Rodberg, Farkash – Simcha Barbiro, Aner – Gur Koren, Bosmat – Mazal Malka Ketty/Nava Levy, Tehila – Lia Amram Rokah, Chloe Maroely, Emily Malishava.